I have updated how I eat the natto. I cut out the ginger and other stuff, and settled on something super simple: just sweet potato, tahini, and Redmonds Real Salt. It's pretty bland sans salt but could still work without it. Tahini masks the taste of natto fabulously! It not only masks the taste, it's sticky so it masks the spider-web texture of the natto too. Win-win! Mix together (easier said than done with natto, but once the spider webs calm down, it's good to go). Add sea salt or Real salt if desired. Enjoy! 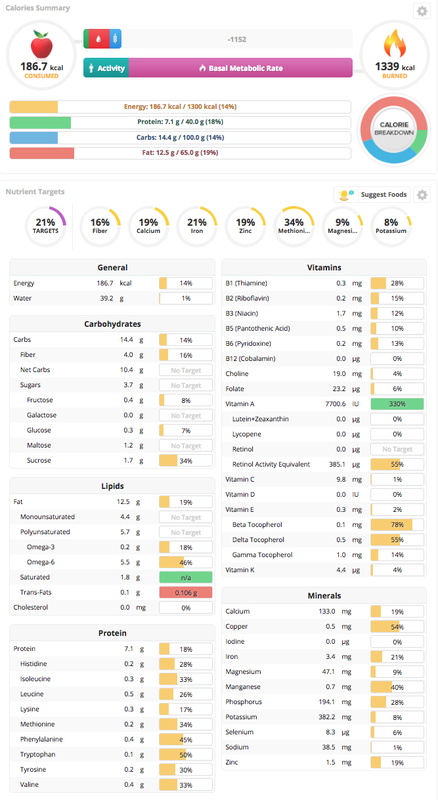 Note that the Chronometer application (above) uses incomplete nutrition databases, so it is not showing the Vitamin K2 for the natto—I assume it is showing K1. 5/31/17: calcium level 120 (way over ideal, which is 40. My body was depositing calcium in my hair, and probably arteries and joints, because it was not bio-available). 12/7/17: calcium level 38 --within ideal range!! During the time I brought my hair calcium level down to the proper level, in addition to eating natto, I also brought my Vitamin D level up from 31 to 71 using Vitamin D mushrooms, a Sperti Sun lamp, and outdoor sun exposure. I can't be sure it was the natto, but I'm impressed I resolved my "calcium shell" condition in 6 months so dramatically, and I think natto played an important part. Dental Feedback—Massive Plaque Reduction: Vitamin K2 moves calcium from places it should not be, like arteries and joints, to where it should be -- in the bones. People who take K2 note that it often clears up the plaque on their teeth (you can read that in Amazon reviews of Vitamin K2). My dentist was SO AMAZED at my lack of plaque, he commented on it three times at my last visit. "Look at this, Melissa! Look at this — no plaque! Plaque is not your problem, that's for sure!" I knew he would be impressed because I could feel the difference on my teeth, but it was fun to get the feedback. Thanks Dr. Simone!